Author Nick Williams explains, "When we find our gifts and contribute them to enhance the lives of others, there lies our greatest joy. Knowing that each of our lives weave together and that we are intrinsically connected makes our work meaningful. We can choose the kind of contribution we want to make and consciously discover the joy of giving and making a difference. . . . Love simply flows through us as we continue to commit to contributing. It requires no sacrifice, and follows from our own strengths, aptitudes, joy, interests, inspiration and passion. True contribution energizes us and makes us feel that we have arrived home in our heart. The desire to be truly helpful is the wish to serve. . . . The work we were born to do is about serving the world in a way that we enjoy and that we are uniquely talented, gifted and equipped to do." Excerpted from The Work We Were Born to Do. Does TOS work flow from joy and passion? During the Theosophical Society in America's Summer National Convention (July 2013), TOS-USA President Nancy Secrest shared a multi-media presentation showing some of the TOS-USA projects over the past year or so. Nancy's presentation left no doubt that TOS members are serving from a joyful heart. Some care for the environment, some do healing work, some care for animals, some work to end hunger . . . the passion and commitment shown by TOS workers was moving. But when it came time to present TOS-USA's projects for children, there were so many projects that they were placed in video format to present them in the allotted time. I invite you to watch "TOS-USA for Children" (3:30) to see what's been accomplished by TOS members serving from the heart "for passion, not duty." 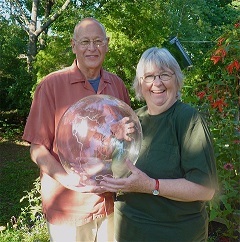 Above: a beautiful example of serving from the heart--TOS members Tom and Susan Ockerse joined with world-wide voices, singing with intent to heal the Earth.